home You got a hankerin' for some spankerin'? 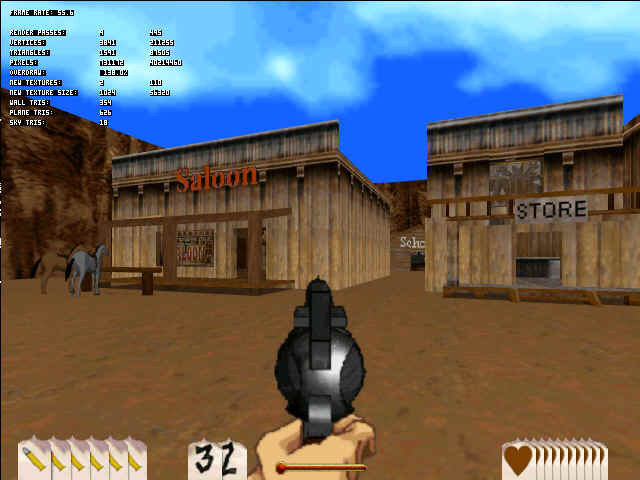 Paleface's unsolicited critiques of Outlaws levels, players, posses, an' everythin' else! Only place I know of where Outlaws players still get together on the regular for playing the game, as well as for all kinds of other Outlaws-related hootenannies. It's a "closed" Facebook group, but I hear tell that anyone who clicks and requests an invite with a little genuine Outlaws love in their heart is quickly welcomed with open arms. 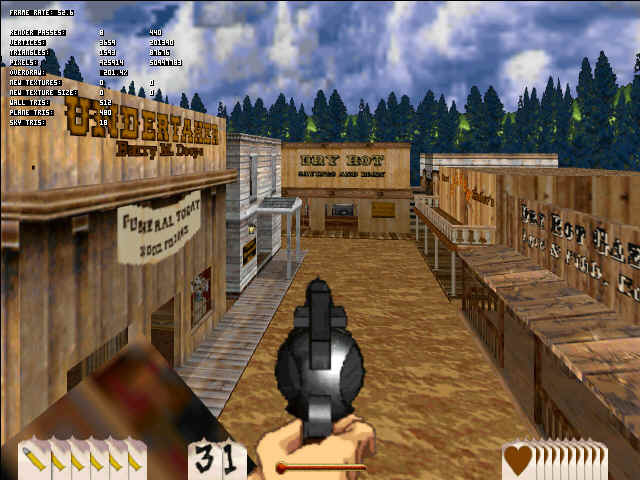 This snazzy, easy-on-the-eyes huge Outlaws map site is still posting and even reviewing new Outlaws levels! Yep these're spangly new maps you can't even get in my musty ol' archive (they've got all those, too), so head over there and check 'em out! I should have done this much, much sooner, and it's more or less a moot point now, but at any rate let me just "officially" and certainly very belatedly ring in the end of updates to this site. If you'd like to know just what in heck my excuse for putting that off for nearly three years is, well, I was working in the game industry and let myself neglect pretty much everything else in my life. You shouldn't do that kind of thing--it's unhealthy and rude--and I hope I've finally learned my lesson. So, my apologies to those who sent me maps and news that I never got around to posting, and to the readers who found the site fallen silent with no explanation. If you'd like to give me a piece of your mind, you can do so on the forum for my current project, Supermassive Black Hole A*, an animated webcomic with a ridiculous name. There's also more detail there about why I became such a slacker here over the past few years. Now I'm gonna try to post the stuff I was sent since my last update, oh so long ago; I'm a little rusty at this so bear with me. 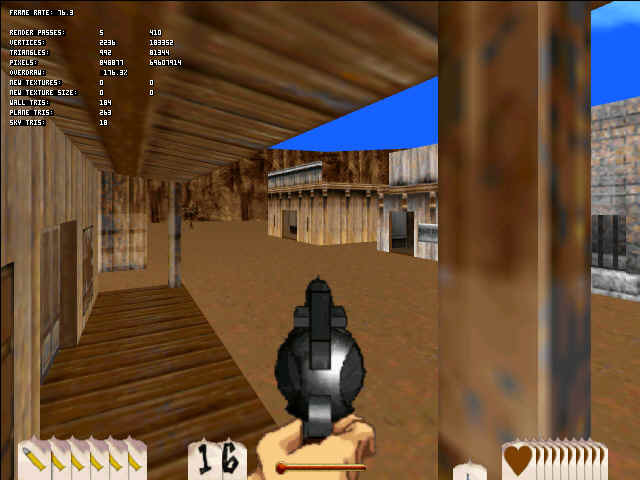 I don't think my current "modern" computer is Outlaws-compliant, and I suppose I've lost touch with what makes a good OL map anyway, so I'm just going to post the levels I was sent, sight unseen, and hope they're good and don't contain horrible viruses. So please be cautious if you download them. They'll stay in my "temp" folder. This will be the last Outlaws update I post here, so please do not send me any more news or files to post, because it won't get done. 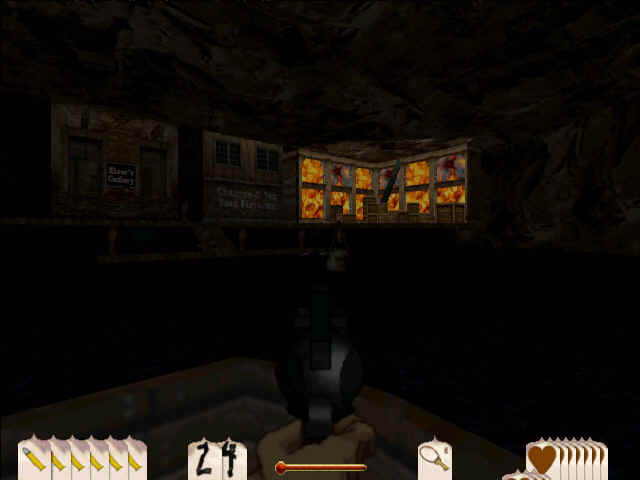 Crow mentioned that "Call of Juarez," an Old West first-person-shooter for PC, came out, and he seems to have liked it. Checking the Call of Juarez site now, the forum still looks to be quite active, and I see Crow himself posting in their multiplayer forum as recently as two weeks ago. 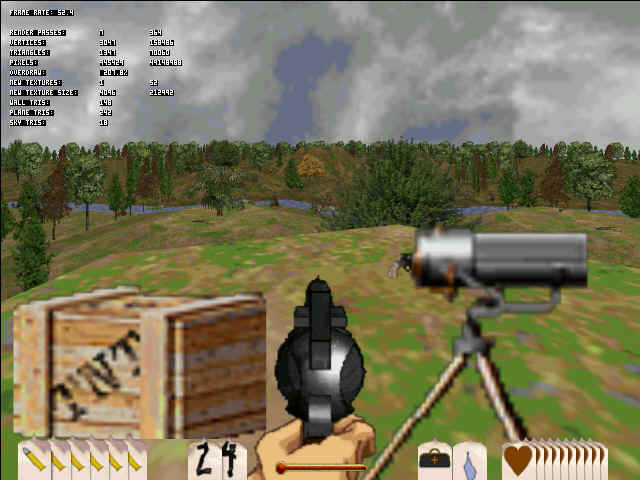 What was "Outlaws WarZone" (see previous update) evolved into "The WarZone." Thanks to Captain Picky for sending the link. Site that claims to have a matchmaking utility (I haven't tried it) which, according to the site, supports "multiplayer versions of older DirectPlay 7 or earlier games," including Outlaws. The site also hosts a forum to talk about the application, matchmaking, and the games. Lars Fredriksson wrote in from Sweden to say that he saw Outlaws on a store shelf there. He says LucasArts was re-releasing some of their games, including Outlaws, Monkey Island, and Sam and Max, under the label "LucasArts Classics." I'm not finding any real information about something like that (Lars told me about this over a year and a half ago), so possibly it was specific to Sweden or Europe or something, or just very low-profile. Well, that wraps it up for my Outlaws updates. Again, please don't send me any more Outlaws news or files, because I won't get to them. Some things around here like the banners and the links page are out of date, and that's how they'll stay, frozen in time. The site and all the files and everything will stay up indefinitely, which is to say that I don't know exactly how long, since who knows what the future holds, but I have no intention currently of taking the site down, so they'll probably be up for a good long while yet at the very least. Sorry for the ridiculous delay in getting this last post done, and thanks to everyone who helped me out with news, files, and information over the years--all the way back to December of 1997. This here site helped me get into the game industry ten years ago, and I have all of you to thank for that, and for the good times we had dropping TNT on each others' sombreros. Stealth update 3/20: forgot that I had a bunch of signatures to add to the Outlaws Sequel Petition: 436 new ones, to be precise, for a grand total of 3336 signatures. This will be the last update for the petition. I sent them the link once upon a time, and if you're ever in the business of talking to LucasArts about another OL game, feel free to send them the link again! Stealth update 9/11/16: changed links on the links page that were going to dead sites to their archived versions, where available, otherwise deactivated the link. Stealth update 6/13/18: replaced the rotating ad banner at the top of the site's pages with two static banners (the last two remaining that had been rotating "randomly" : P. Now we're compliant with the EU's online privacy rules, yay! Also, fixed an alignment problem with search result pages on high-resolution screens. Dog Holliday sent me a couple new maps, and then, in the best Internet tradition, I stole a bunch of maps from The Outlaw Dad. Most of those are by Molycoat, as you can tell at a glance by all the custom props everywhere. Moly does amazing work, although I also noticed in this large batch of his that he's been putting in a heck of a lot of ammo--I tend to prefer it more on the lean side--and he's been using a lot of invisible walls to fence off his map areas, and I hate smacking my nose into those. 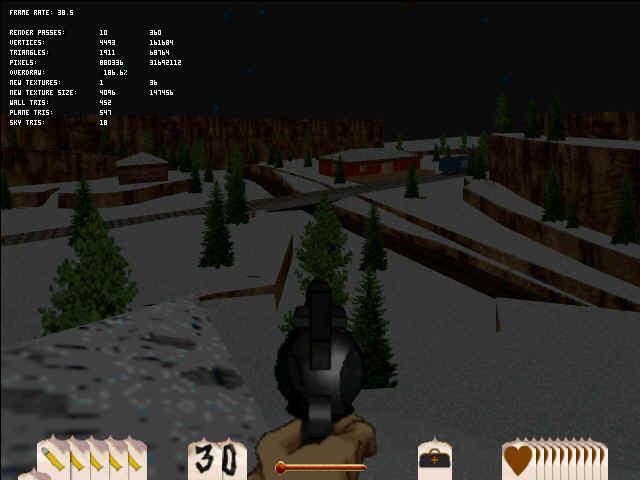 Bear Cat TKMD (shot) by Molycoat: Using the LEC level "Dry Gulch" as his base, Moly turned it into a real ghost town, with blown out windows, doors, and walls, and let's not forget about the two ghost gunslingers in the street. He's also narrowed it down quite a bit. A very attractive map, with lots of places to dodge around in this fairly small canyon, and the ghost effect is impressive. Chickens! 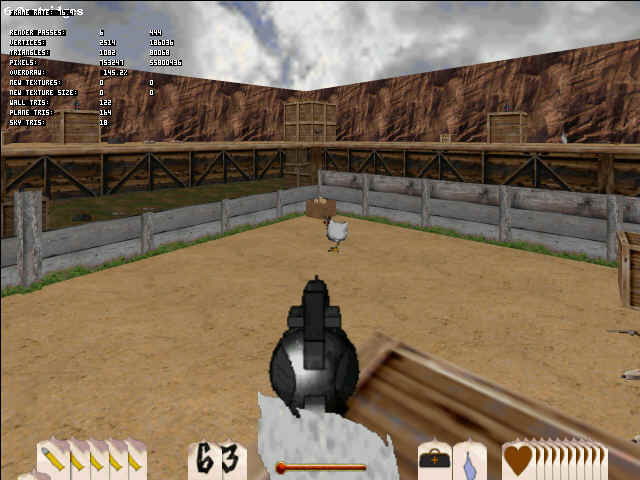 CTKMD (shot) by Molycoat: You play as an actual chicken, here, complete with sunny-side-up-exploding egg grenades, running around inside a large barn/henhouse. Amusing chicken touches abound, oh, and also you make clucking and squawking noises while running and jumping. Who knew being a chicken was this much fun? Chicken Coop CTKMD (shot) by Molycoat: More chicken play, outside in a large coop this time. 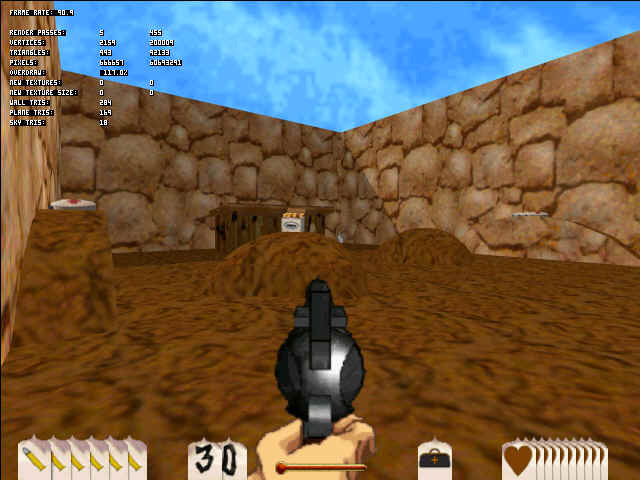 It's a little bare, although with many clumps of powerups. Watch out for the stumbling headless chicken. 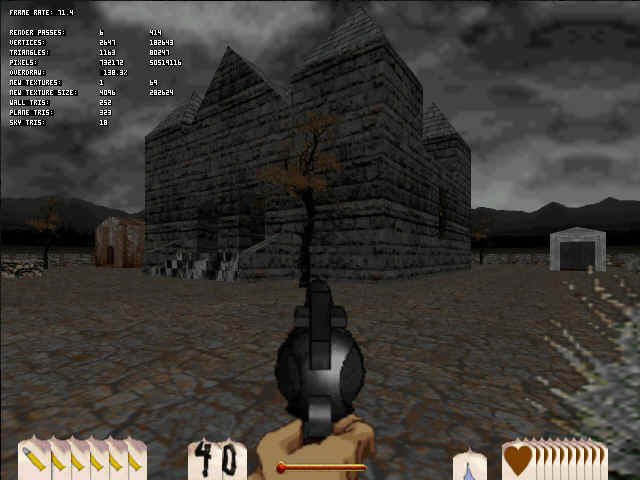 ctf CD (shot) by honored_sheep: Odd, very small map with two lumpy mounds in the middle. Devil's Rectory II CTKMD (shot) by Dog Holliday: Remake of his "Devil's Rectory" map without the interactive bits that can lag things up. Spooky graveyard, crypt, and church. Dry Rot CTKMD (shot) by Dog Holliday: Small town bursting with detail. Lots to explore in each little building, and don't forget to make it up to the roof level. Elk Pass CTKMD (shot) by Molycoat: Fight on a curving high mountain path. Down below you can see a crowded, twilight town (based again on Dry Gulch), with people standing around everywhere, lights glowing in windows, and so forth. Really impressive to see, although it drops the framerate some. You can't actually get down there (invisible barriers), which kind of makes it a neat distant view, but is also kind of frustrating. Seems more like a eye-candy map than one you might spend a lot of time playing. El Plomo CKMDT (shot) by Honored_sheep: Smallish western town with a few buildings and custom signs. 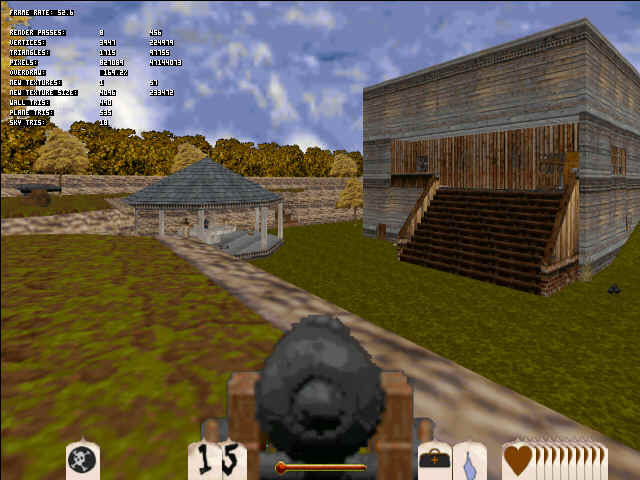 Kenny's Place CTKMD (shot) by Molycoat: Based from the house and yard at the end of the "Civil War" historical mission, with slews of Moly's usual detailed custom graphics, and a semi-portable cannon. lilstick CKMDT (shot) by honored_sheep: Tiny little canyon with some rudimentary buildings and underground passages. 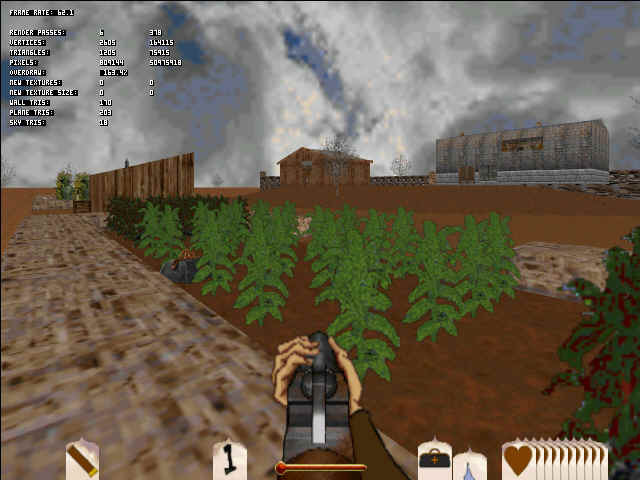 Lost Plantation CTKMD (shot) by Last1Standing: A little farm with actual planted parts (tobacco and corn, says the readme). Got a nice realistic look about it, and I like the gradual sloping hill between the crops and the buildings. Minitown TCKMD (shot) by Honored_sheep: Canyon with a couple little shacks and dramatically slanted lighting around one side. The .zip includes a file called "xcredits.txt," which will replace the normal credit roll you see when quitting the game--the list here is Outlaw player names. I find this inclusion of a mod not at all related to the map itself rather irritating, since I usually extract all the files from a map zip into my game directory automatically--and now I've got a screwy credit list. Bleh. 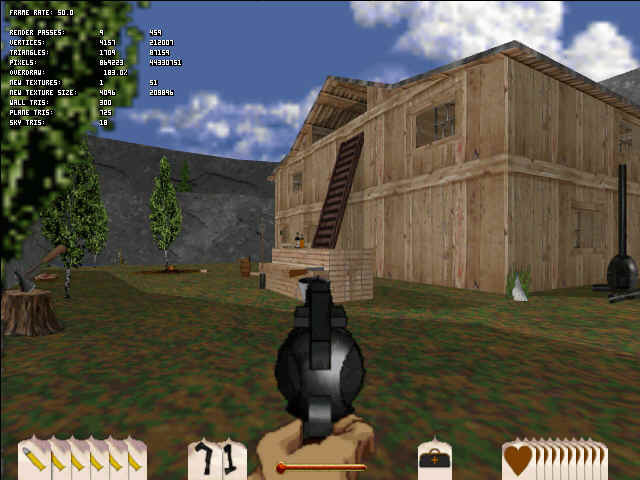 Saloon MD (shot) by Honored_sheep: You're stuck inside a medium-sized saloon, reminiscent of one from one of the Historical Missions. Also includes that annoying xcredits.txt mod. 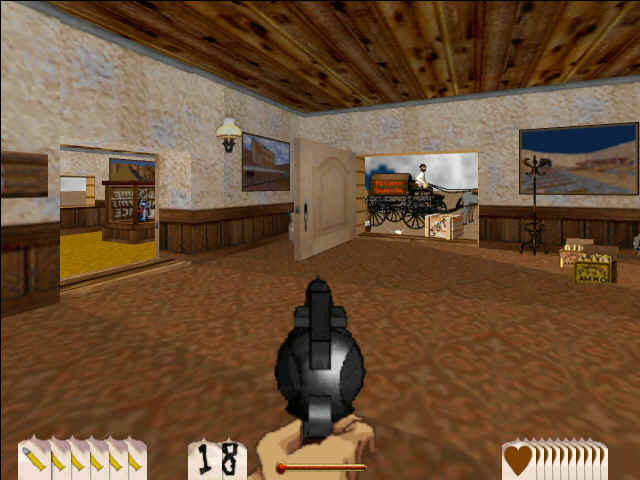 The Sands TKMD (shot) by Molycoat: Little hotel, or inn I suppose, with custom graphics EVERYWHERE, many of them having OL player names. Some pretty hilarious stuff. So many colorful posters and props that it can be tough to spot the powerups among them. Some of the items are more modern-day than Western, including cartoon character images, etc. Make sure you shoot the things you see outside through the windows, 'cause they actually do something nifty when you do. Again an impressive map visually, but maybe not one you'd come back to repeatedly after you'd taken in all the clever details. Oh! Like the little mouse-hole behind a counter, that you can look in (the mouse/rat/whatever is outside chewing something) and see his little mousy furniture! 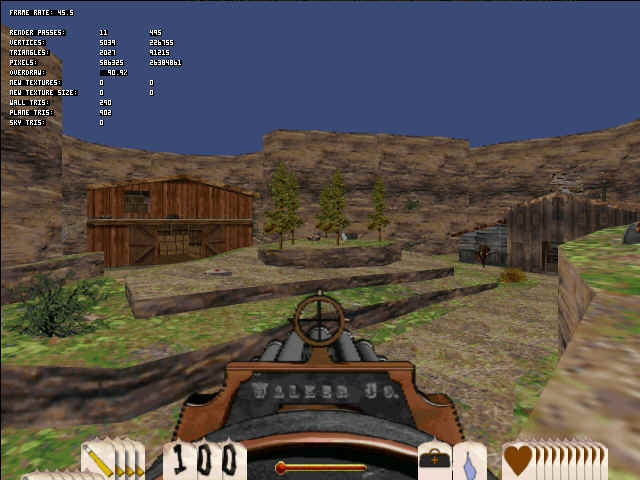 Vaquero TCKMD (shot) by Molycoat: Medium-smallish canyon town with custom graphics here and there. Watch out for the chain-reacting exploding barrels lining the street. 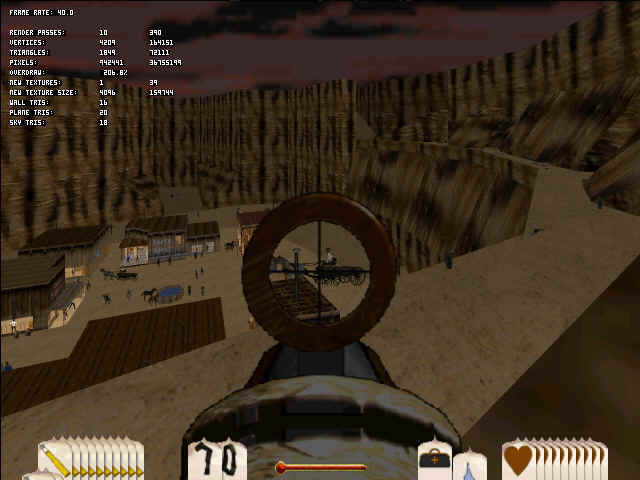 Vin_Egar seems to have changed his "Outlaws High Noon" URL, and changed the site, too, with his OL "servers" gone, replaced by a downloadable app called "Outlaws WarZone," which appears to be a sorta-hacked version of regular WarZone, a matchmaking service that duplicates the old MS Gaming Zone lobby in a rudimentary way. I couldn't get it to launch OL after I hosted a room, but maybe I was doing it wrong, or maybe it just doesn't like NT or something to do with my ancient and probably weirded-up OL install. It's a funky process to install this thing, because the first time you run it, it auto-updates to a non-hacked version without an OL lobby, and then you have to re-install the hacked OL version over that. Vin_Egar is also now hosting some files of which I am rather less fond. At this time of summer evening, the cows are trooping down from the hills, lowing, and with their bells tinkling, to the old town, with its old moats, and gates, and spires, and chestnut-trees, with long blue shadows stretching over the grass; the sky and the river below flame in crimson and gold; and the moon is already out, looking pale towards the sunset. Whoa, wait, what year is this? Uh-oh. Guess I'd better get these maps posted then! Ice Water TKMD (shot) by Molycoat: Gorgeous winter map with snow-coated canyons running around a broken central bridge. 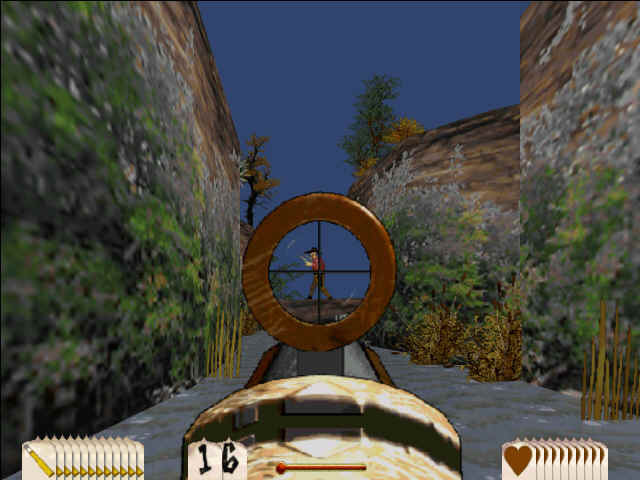 Lot`s of tricky ledges to navigate (gotta get those sniper rifles and gatling guns), and the way you can just make it across the bridge gap at a run is quite well done. Bill Morgan's Place TKMD (shot) by Molycoat: A few cameo appearances on the upper ledges around this one-house canyon add a little drama to the scene. Small map, and the inside of the house is slightly cramped, but that's partly due to the world of detail packed in there, like the fully equipped workshop. The three ways you can access the open attic add a lot of strategy and flow to the place. I love the driftwood bobbing in the pool. Hoth Revisited CTKMD (shot) by Molycoat: Remake or mod or something of the old Star Wars-themed "Hoth" map. 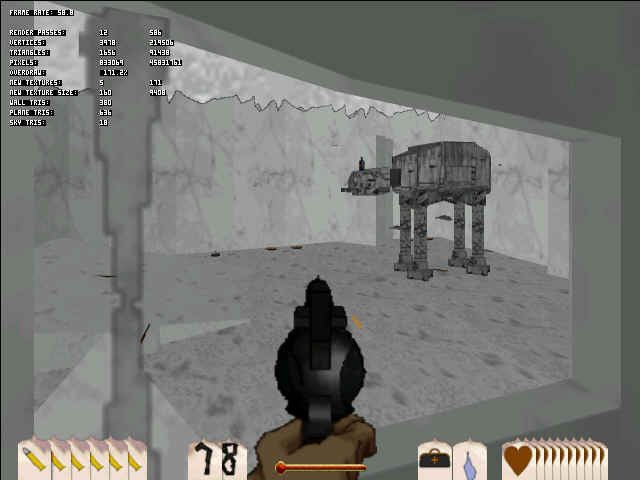 I don't remember the old one having quite this many little icy passages and sniping points in the ice walls running around the AT-AT, and I'm pretty sure the little fighters weren't hovering around it in the old version. Small map, but a bunch of people could get lost in the little tunnels. Black River Bridge CTKMD (shot) by Captain Picky: Expansive rocky plains snowscape that plays smaller than it looks, as much of it is area you can't get to. The interiors of the three cabins are a little bare, but it's mostly about efficient navigation of the low ledges around them. Slightly lower framerates at some of the sniping points around the edge, but considering how open the center is, snipers will probably still do pretty well here. 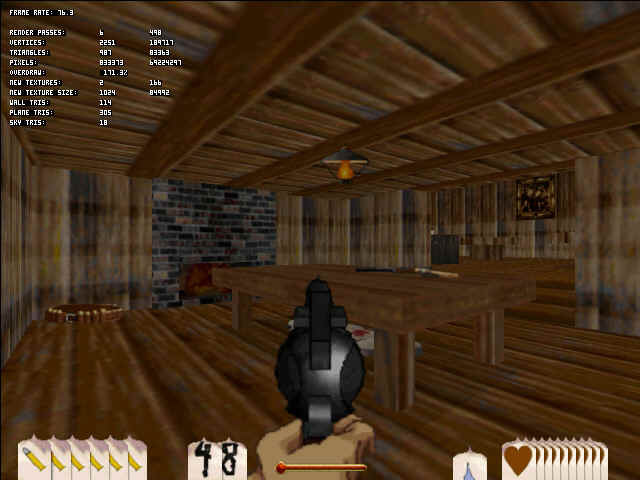 Sweeney's CTKMD (shot) by Molycoat: I've been saying some of these maps were small, but this map centered around a high mountain cafe in the pines is even smaller, and that gat on the roof might be more suckerbait than anything else. I like the dark blue pines, the details inside the cafe, and the effect of lantern light casting through the windows. Framerates are quite high. Tiny Sanc CTKMD (shot) by sheep, Molycoat, and Last1Stndin: The small map theme is on a rampage now, with this perfect re-creation of Sanctuary--in miniature. Or have you just grown to about ten feet tall? You have to duck through doorways, and don't even think about fitting down into that hole beneath the jail, now (just as well, since that crazy rabbit seems to be holed up down there...). I'm not so keen on the ease of navigation here, but it's a great joke for long-time Sanc players. Knobby Garden CTKMD (shot) by Molycoat: Brilliantly unique layout here, with two hexacombs (can I say that?) of little knolls facing each other across a flower-strewn brook. Lovely plants abound, but despite the carefully manicured grounds, it also gives me a feeling of a WWI trench war, with sort of a camo-like pattern in the turf, and a long trench running between the two sides. Running around the rolling terrain has a very different feeling from almost all other Outlaws maps, you really should give it a try. Gatfield's CTKMD (shot) by Molycoat and Dog Holliday: Cool organic map with a farmhouse and a barn in a small, curvy-walled canyon. The rounded, tiered hill in the middle is quite nifty. Ah, but this isn't just a tree-hugger's paradise; they've given you modified, high-speed gatling guns to run around with. Interesting how the TNT sticks laying around tend to go off with all that lead spraying around. The farmhouse interior shows Moly's usual insane attention to detail. Should be a very fast, fun map, and it's nice to look at, too. 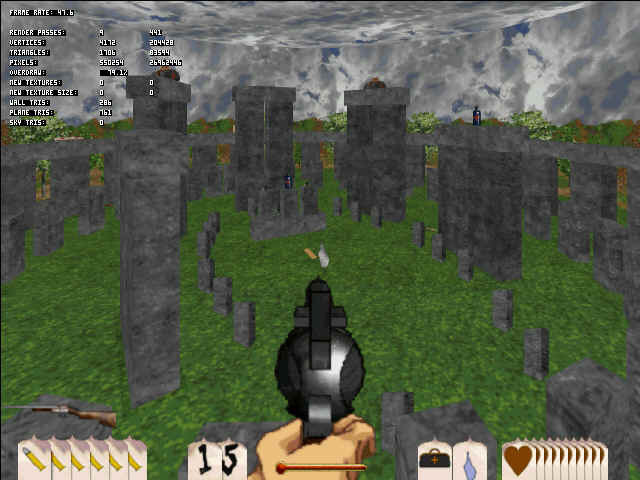 Stonehenge CTKMD (shot) by Molycoat: Another tiny map, and really too tiny, but according to the readme, the OL engine just couldn't handle the normal skyline and that many big rocks all in one go, so Moly had to bring in the borders and paint on a low, custom sky ceiling. The overall effect is unfortunately a little jarring, and all the rocks are a little cramped together, making it a bit hard to dodge and weave. Outlaws acrobats will have a challenge navigating all the stone-to-stone jumps here. 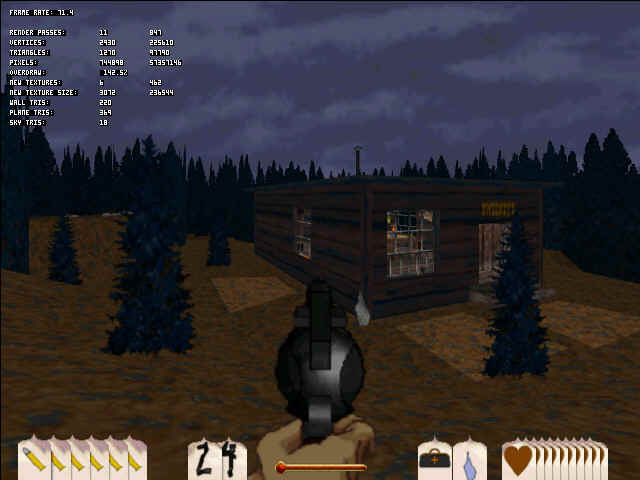 Tin Star single-player (shot 1, shot 2) by Dog Holliday: Puzzle fans will love this one, as there are pretty tricky puzzles right from the get-go. In fact just the first one took me at least a half-hour... They're impressive, but sometimes I think they're a little unintuitive. The stages are hard on a physical level as well, with really deadly boss badguys everywhere, and insta-death traps at every step. There are also a few places where you can sort of get stuck outside the scripting. Still, it's highly impressive, and really feels like you're on an adventure. Now if only I could figure out that crank part on level 2... Run the map by launching the included .bat file, and then choose single-player, or whatever it is on the main menu, and you'll see "Tin Star" in a list. Ahah! And it looks like people assumed I had died or something, and stopped sending me maps. You can find a bunch of more recent maps over at The Outlaw Dad's. I'll see if I can steal 'em and get 'em posted here in a week..err...or two. 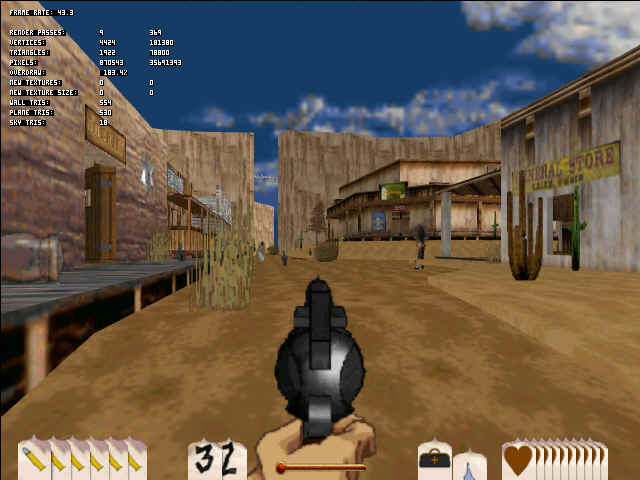 Outlaws is a peer-to-peer game, so you don't really have "servers" like you do in most multiplayer FPS games, but that doesn't mean you can't run a client on a fat pipe like a server, and people can always find a game there. I run my own little server like that (see the "domain" page), but there are people with a more sophisticated approach, people like Vin_Egar. He's got three servers going now, and he says the hardware specs for them are "Pentium 4 over 2GHz, 512 MHZ, DDR Dram, DSL, 5 Static IPs all 80 GIG HD." Which beats the heck out of my little old server. So, go check his site, and try 'em out! Not a great site layout (and watch out for the noisy animated banner on the front page), but you can find some Outlaws IP games hosted here, and the maps they're serving. Raf let me know about LawMaker, a Western game in development by Darkroom Studios. It looks like they've developed their own 3D engine ("The LawMaker Engine"), and are using the game to pimp it out to prospective licensees. 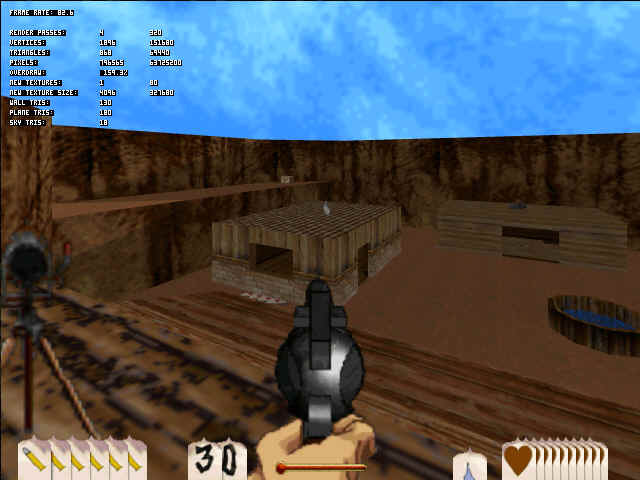 Rather curious coincidence there, how it's named the same as Outlaws' level maker, eh? Anyway, you can check out lots of screenshots and stuff at the site. Crow pointed out that they've got a closed beta server going for Wanted: Outlaws and Lawmen, a Western mod for Half-Life 2. 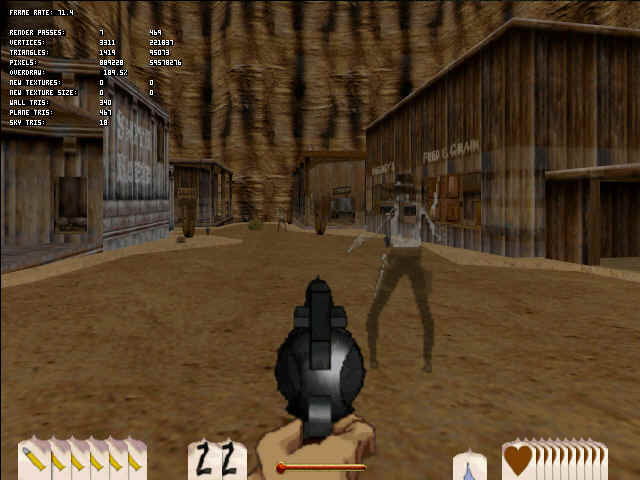 And then he also found a Western game called Call of Juarez, a commercial shooter being published by Ubisoft in "summer 2006" in the U.S. and Germany, from developer Techland (who might be German?). Their teaser Flash site is really slow to download, but there are a lot of screenshots to peruse if you're patient enough. She wasn't changed. She was a little pale, a little stouter in figure. Her eyes were the same, the kind trustful eyes. Simple Search created by Matt Wright and can be found at Matt's ScriptArchive.